Aplogies. It appears the RMWEB copied an old post of my UK layout. I recently purchased four of Bitter Creek's ground throws and I really like how they work and how they look. I'll be installing more on my layout. Some might like a set of contacts for remote LEDs to indicate switch position...like me! Thanks, Ken, for the corrected link. It nicely includes a wide-ranging discussion of several ways to do ground throws. I do like the idea of putting the Caboose Industries throw down between the head blocks, making the huge mechanism rather less obtrusive. But you still have the operating bar that is around 7 scale feet long. 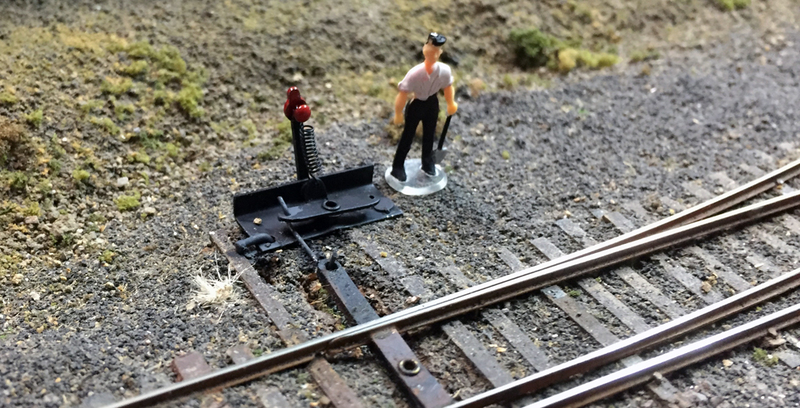 After using Caboose throws on a switching layout and watching them gradually bend and wear with age, I have been on the lookout for alternatives for some time now. The bending and failure of the ground throw may have more to do with my installation alongside hand-laid track than the throw itself - I may be stressing it beyond what it was intended to do. 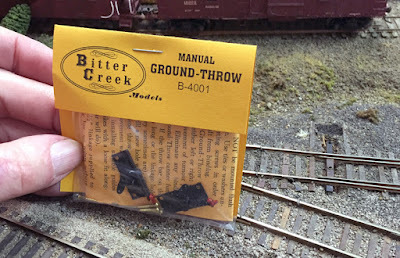 I agree that they are grossly out of scale for HO, but I don't think the Bitter Creek unit looks much better. You trade a smaller size for something that looks less like a turnout mechanism, apart from the actual arm/handle. And the 'bury it beneath the headblocks' approach has one flaw - if you need to replace the throw, you've got to remove the headblocks. However, that can be worked around and it sure does look closer to size. The headblocks also serve to prevent overthrow, stressing the turnout and the throw itself. Can you use the bitter creek on N scale? 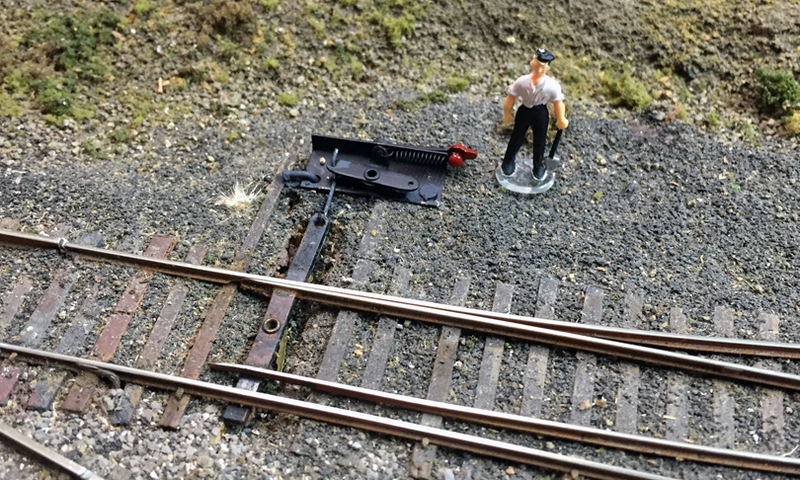 I don't know if Bitter Creek makes an N-scale mechanism. The HO scale one has a fair overpressure (good) in HO, but that might be too much in N.
I like using the Caboose Industries ground throws because they operate just like the prototype. They are much too large but I use the even bigger O scale version and mount them below the surface and at the front edge of the layout, linked to the switch with a rod and pivot. You can then use a dummy scale size switch stand on the layout. This eliminates reaching into the scene and the risk of damaging something. 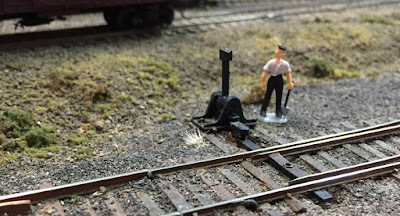 I use a flat head screw through a piece of tubing to mount the Caboose Industries stands. The length of the tubing is measured to position the screw head at the right height to keep the throw handle from being pushed below a horizontal position. If you have trouble with the handle popping out of position you can replace the plastic nubs with a longer piece of heavy wire drilled into the rotating drum. Hi, Mark, nice to hear from you. I agree that as soon as the operating mechanism moves away from the switch itself, size and shape considerations become much less important. To me, the biggest gain with the Bitter Creek throws is that they lie very flat and are not nearly as visually jarring as Caboose Industries throws; this is especially evident in photos. 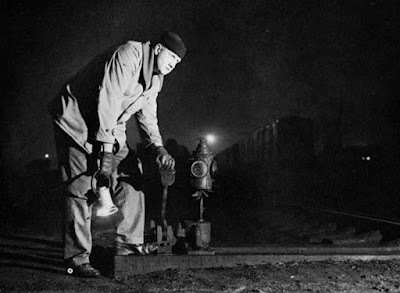 For years I composed photos carefully to try and keep the Caboose throws out of the photo. I find myself far less conscious of ground throws in my photos now. Gave up waiting for Bitter Creek to produce more ground throws. I really like them, but wanted to get my switching layout operational. I actually spoke to the owner last April and he thought he would produce more by the end of last summer. Oh well. Having used Tortoise machines forever, I installed 12. Since I hand lay and prefer power routing my frogs, Tortoises are a good (and less expensive) solution.